You may remember the name Blippy from such startups as the one that shared your credit card purchases with friends. The concept died. But the name lived on. Another team of Silicon Valley entrepreneurs bought the domain for Blippy, and they’re using it for a new app that makes it dead simple to find and make animated GIFs. Because we all wish we could find that perfect facepalm or dog GIF to strike the right note. Co-founder David King, who previously built up a social gaming company Green Patch and sold it to Playdom (which was then sold to Disney), said the app taps into an emerging trend of visual communication. Not only are we seeing stickers take off in apps like Line, Facebook Messenger and Path, ephemeral messaging app Snapchat is also about very fast, visual communication. Anxious bears, woeful bunnies and typing cats capture feelings words can’t quite match. But one obvious and missing link seems to be in animated GIFs. 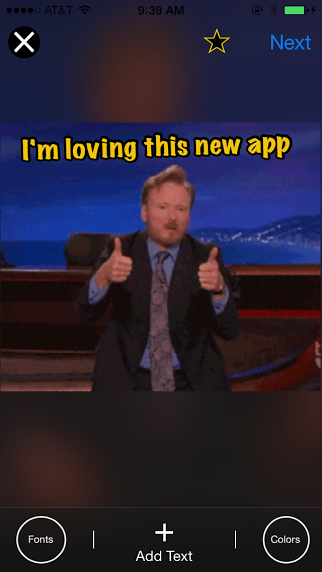 They run wild through platforms like Tumblr and our internal TechCrunch newsfeed, but there hasn’t really been a breakout mobile app for animated GIFs. Basically, it’s just technically difficult to make a messaging app with working animated GIFs outside of products like iMessage. There are issues with speed, or problems with creating an effective GIF search without proper tags or keywords. The new incarnation of Blippy is starting from a pretty basic place. It’s not a full-on chat service. It instead just makes it easy to find the right GIF to share through iMessage, Facebook, Twitter or Tumblr. “We want to be just focused on finding and curating great GIFs,” King said. There are categories for pets, celebrities, sports, #fail and so on. Then there’s a basic search engine that you can swipe down from above. Once you pick one, you can overlay a personal message in any number of absurd or “elegant” fonts and colors. Then you just zip it off to iMessage or any other of the big platforms. One feature not available now is the ability to create animated GIFs from your phone’s video or photo library. But it’s one that may come shortly.